Hey everybody! JuniorTennis7 here! I haven't published any games in a while, so I thought I would just make a short 1-level game in the meantime. 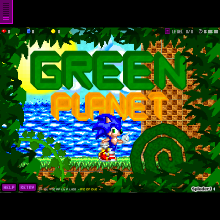 Here it is, Green Planet Zone, a peaceful, vast forest with Green Hill Zone-inspired graphics and enemies. I made this game to keep you guys occupied while I work on my next game, which is going to take a few more days to make. Maybe even a few weeks. And as Shelly and TV Lucy have said already, that game is Super Mario 3D World! So get your bodies ready!